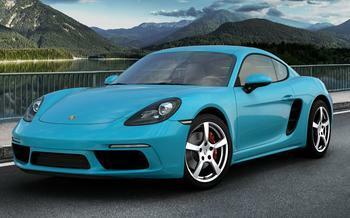 Porsche Cars North America is recalling 14,388 model year 2017-2019 718 Boxsters, 718 Boxster Ss, 718 Caymans & 718 Cayman Ss; model year 2018-2019 718 Boxster GTSs; and model year 2018-2019 718 Cayman GTSs. In the event of a crash, a crossmember may detach from the luggage compartment bracket, possibly causing a fuel leak. Porsche will notify owners, and dealers will secure the crossmember with additional rivets free of charge. The recall is expected to begin April 21, 2019. Owners may contact Porsche customer service at 1-800-767-7243. Porsche's number for this recall is AKA3.